Earlier this year, in an announcement that has become more routine around the world, Suy Sem, Cambodia’s minister of mines and energy, declared a moratorium on the construction of big hydropower dams until at least 2020. The country’s decision to halt new dams follows rising distress in Southeast Asia over the financial, ecological, and social consequences of building big and expensive hydropower projects, especially on the Mekong River and its tributaries. Cambodia joins a lengthening list of nations around the world that are reassessing big hydropower dams. Cambodia joins a lengthening list of nations around the world that are reassessing big hydropower dams in an era when wind and solar power are less expensive, much easier to build, less damaging, and far less vulnerable to droughts and floods. By no means have the nations of Africa, Asia, and South America completely lost their affection for big dams. The World Bank, the China Development Bank, and other powerful multilateral and national development banks continue to pour $US billions into projects to dam rivers in Africa, Asia, and South America. But the level of investment in big water-powered electricity projects has been flat for much of the last decade, and is now being overwhelmed by financing for renewable energy, led by wind and solar power. Last year, according to the United Nations Environment Program, newly opened hydropower projects supplied 22,000 megawatts of generating capacity. In contrast, international developers opened 118,000 megawatts of wind and solar generating capacity. Investors in hydropower globally spent $US 43 billion in 2015 compared to $US 285.9 billion spent on wind, solar, and other renewable sources of electricity. Until very recently big hydropower projects were seen as essential to stabilizing electricity supplies in power-hungry developing nations. Private developers and national leaders viewed the big dams, capable of supplying thousands of megawatts of needed electrical generating capacity, as feats of human ingenuity and symbols of economic progress. During construction, the big dams typically employ thousands of people. Hydropower, according to the most recent government and private sector summaries, supplied 1,064 gigawatts of generating capacity in 2015, about a fifth of the total 5,250 gigawatts of global electrical generating capacity. Hydropower also is viewed by its proponents as an antidote to the carbon-intensive air pollution from fossil fuel power plants that contribute to global climate change. The carbon-neutral reputation of hydropower, though, has come under intense scientific dispute. Big dams and reservoirs destroy carbon-absorbing forests. Biological decay in reservoirs produces ample amounts of methane, a climate change gas more powerful than carbon dioxide. The global pivot away from big hydropower projects is consistent with trends that affect mining, big irrigation projects, and construction of coal-fired and nuclear power plants. Massive hydropower projects are an artifact of the water-intensive, resource-consuming global development strategy of the 20th century. In the 21st century, though, the scale of the big dams and their reservoirs has incited anger among rural and indigenous communities that are waging ferocious campaigns to defend their fisheries and land. Big hydropower projects take a decade or more to build, and experience average cost overruns of 70 percent, according to a 2014 study by researchers at the Vermont Law School. Average cost overruns for wind farms were 7.7 percent and for solar plants, 1.3 percent. Lastly accelerating changes in the Earth’s hydrological cycles, and earthquakes and floods in the Himalayas, one of the world’s active dam-building regions, curtail power generation. In Panama in late June the Ngäbe-Buglé indigenous tribe halted the filling of the big reservoir behind the 28-megawatt Barro Blanco dam on the Tabasara River. The government’s decision followed a big rally and march on June 6 by the tribe and its allies to the Panamanian Presidential Palace. The demonstration was the latest in a long history of resistance to the project. In 2012, Ngäbe-Buglé demonstrators shut down the Pan American Highway with several days of anti-mining and anti-hydroelectric dam protests, culminating in a clash with police that left two people dead and 40 injured. Ngäbe-Buglé leaders assert that their rights have been violated and their land, culture and livelihoods are threatened by the project. The Panama government met representatives of the European banks funding the project on July 6 to explore next steps. More than a year after a mammoth earthquake struck Nepal, the country’s plan to develop 10,000 megawatts of hydropower generating capacity over the next decade is faltering. Thethirdpole.net, a news organization that covers the Himalayas, dispatched writer Ramesh Bhushal and photographer Nabin Baral to the Dolakha district to report on the condition of the Upper Tamakoshi dam, Nepal’s largest hydropower project, under construction on the Tamakoshi River. The earthquake wrecked roads and made access to the remote region nearly impassable, delaying construction indefinitely. Similarly, dam construction in India’s Himalayan states faces enormous risks from earthquakes and floods, which have emboldened civic campaigns to block new hydropower projects. A 2013 flood in Uttarakhand heavily damaged hydropower dams in Uttarakhand. In Arunachal Pradesh, a Himalayan state in India’s northeast, the threat of earthquakes, environmental damage, and land evictions has spurred violent protests by indigenous tribes that live in the high mountain valleys close to the border with China. Brazil’s dam builders also are struggling. In April, the Guardian newspaper reported that plans to build the 8,000-megawatt São Luiz do Tapajós dam, projected to be Brazil’s second largest hydropower project, were suspended indefinitely by Ibama, Brazil’s environmental agency. The government made its decision to delay the dam’s licensing process over concerns about its affects on the indigenous community in the region. “Around 10,000 Munduruku people live around the river Tapajós,” the Guardian reported. “The dam would flood a vast area, requiring the forced removal of at least some indigenous communities, an act that is strictly prohibited by the Brazilian constitution except in cases of disease epidemics or war,” the newspaper reported. The São Luiz do Tapajós project, the largest of five big hydropower projects on the Tapajós River and its tributary the Jamanxim, is expected to drown nearly 400 square kilometers (154 square miles) of rainforest and lead to 2,200 square kilometers (850 square miles) of deforestation, according to “Damning the Amazon,” a Greenpeace report made public in April. “Experience of previous and ongoing Amazon hydropower projects has shown that dams can wipe out huge areas of habitats such as alluvial forest that are dependent on seasonal flooding, and have devastating impacts on populations of fish and aquatic reptiles and on the life cycles of mammals such as turtles, caimans, otters and river dolphins,” said the authors of the Greenpeace study. Never have large hydropower projects come under such serious opposition and encountered such dramatic changes in ecological conditions as they do now. That has not deterred, though, some of the biggest investors in large dams, especially the world’s multi-lateral development banks. 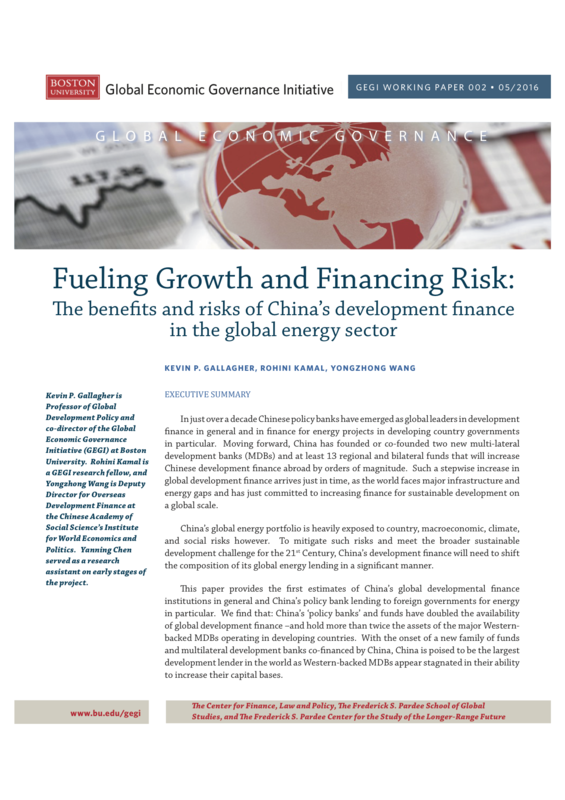 From 2007 to 2014, the China Development Bank, the World Bank, and three more of the world’s biggest multi-lateral banks invested $US 236.5 billion in energy development globally. Of that amount, according to a May 2016 study by the Global Economic Governance Initiative at Boston University, 41 percent or $US 97.25 billion financed hydropower development, almost all of it for big hydropower projects. The nearly $US 14 billion directed annually by big banks to hydropower projects is a principal factor behind the damming of the world’s three great rivers –- the Congo, Mekong, and Amazon — and their tributaries. The hydropower development in these rivers has raised alarms among biologists and ecologists, who assert that with the opening of each dam the world’s best freshwater fisheries decline. In Cambodia, two of the Mekong River’s most important tributaries will be affected by the Lower Sesan 2 dam, which is under construction near the confluence of the Sesan and Srepok rivers in Stung Treng province. Critics say the 400-megawatt power dam and its large 33,560-hectare reservoir (83,000 acres) is forcing the eviction of 5,000 people, many of them ethnic minorities.